A hosted online web pay page ensures business cash flow and continuity after a disaster like Hurricane Irma by enabling customers to make online payments from wherever they are. With no USPS mail delivery, businesses that depend on checks in the mail need immediate solutions to get paid. A pay page helps solve the problem for both parties. A hosted pay page enables customers to passively pay bills online via a secure web page. Payment types may include credit cards, Paypal, ACH (echeck), wire and other methods. Because it’s hosted by a 3rd party PCI level 1 certified service provider, PCI Compliance burden is reduced for merchants. Direct customers to 3rd party custom URL- no change to merchant web site needed. Just email or text the link. Link from merchant web site to 3rd party custom URL by updating web site. Html and pay now graphical button available. 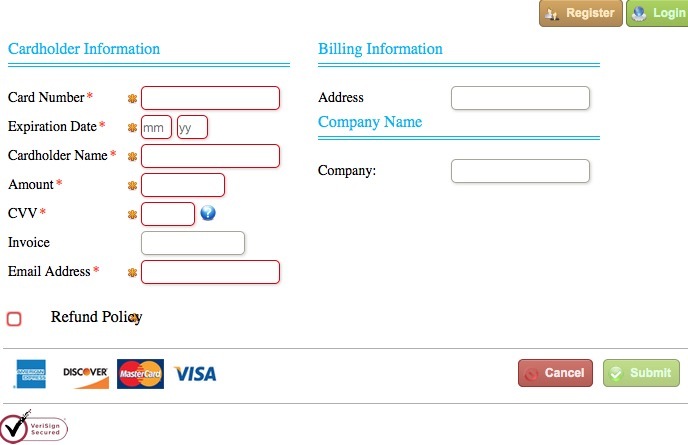 Embed the secure payment object on merchant web site via iframe html. Customers never leave merchant web site, but payment is accepted on the 3rd party web site. There are other ways to collect payment remotely, including our alternative service that enables businesses to push out payment requests via via email or text. This method is proven to increase loyalty as well as reduce time to collect payment and is available for an additional fee. The hosted payment solution selected directly impacts the cost of credit card processing. For example, our solution with Smart Rate Selector automatically optimizes the transaction to qualify for the lowest rate. Compliance with rules are complex and few payment gateways have a solution to comply with every situation. With the right implementation, the cost of card not present transactions are often exactly the same as card present, and can be lower than if employees key enter transactions into a virtual terminal. 3-D Secure: Verified by Visa (Vbyv) and MasterCard SecureCode – cardholder authentication shifts fraud liability back to issuer. Comply with transaction authorization rules (it’s complicated, especially if performing an authorization now and capture later. Available to all businesses impacted by Hurricane Irma or Harvey exclusively through Christine Speedy. This entry was posted in online payments, Payment Gateway and tagged CenPOS, echeck, hosted pay page, online payments by Christine Speedy. Bookmark the permalink.